Proteins are the most abundant organic molecules of the living system. They occur in every part of the cell and constitute about 50% of the cellular dry weight. Proteins form the structural and function of life. The biological function of a protein is due to its conformation, which is defined as the three dimensional arrangement of the atoms of a molecule. 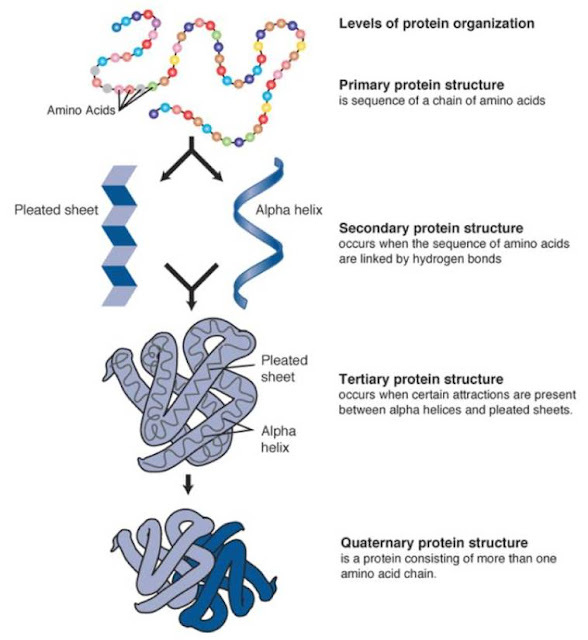 Four basic structural levels are assigned to proteins: primary, secondary, tertiary and quarternary structures. 1. Amino acids are joined together by peptide linkage. 2. The sequence in which the amino acids are arranged in protein is called primary structure. 2. The peptide chain can be coiled to form α helix structure or they can be stretched out to form β pleated structure.